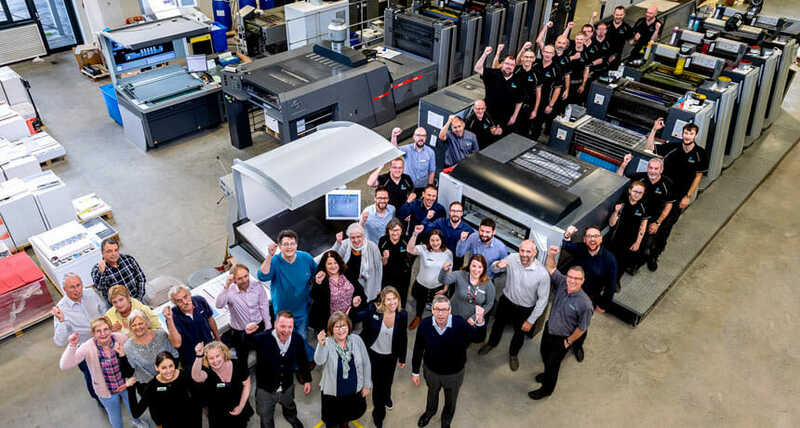 St Austell Printing Company have been recognised as one of Cornwall’s most sustainable businesses at a recent prestigious awards ceremony. 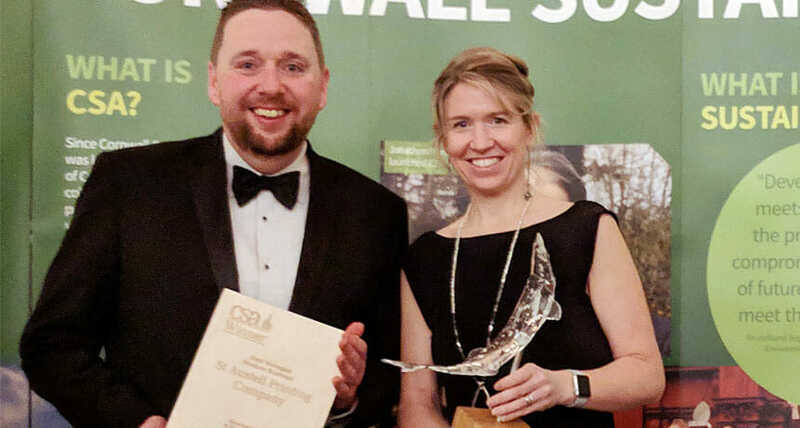 Organised by Cornwall Council and The Environment Agency, The Cornwall Sustainability Awards is designed to reward and recognise the people and organisations that are protecting and growing the natural environment of Cornwall and the Isles of Scilly. SAPC were named winners in the “Best Managed Medium Business” category at the ceremony which took place at the Headland Hotel in Newquay. The award was judged on a large number of critical points including power and water usage, waste and resource management, transport, purchasing and the l0cal economy, buildings, land-use and ecosystems as well as community participation. SAPC were presented with a beautiful eco-trophy which features a recycled waste acrylic cast of a real Cornish mackerel, oak from Pentillie Castle and a small pilchard forged from shipwreck tin. The trophy was created in a collaboration between acclaimed artist Kurt Jackson and St Austell-based studio Leap. Beth Mayman, Operations Manager said that this award was the culmination of a long-term commitment. “When we built our new sustainable factory in 2013 we made a conscious decision that we wanted to embrace all elements of sustainability across our business. From generating our own green energy to recycling 100% of our paper waste and an active commitment to buying local where possible; there are dozens of initiatives we have in place to enable us to ensure we are as sustainable and responsible as we can be. 55 local businesses, individuals and organisations were shortlisted for the 2018 awards including Surfers Against Sewage, Rodda’s, Imerys and Corserv. SAPC provide printing and mailing services for businesses across the UK including Whistlefish Galleries, The University of Falmouth and in 2017 were awarded the worldwide printing contract for Top Trumps playing cards. Recent sustainability investments for SAPC have included the purchase of a new press which uses less power and water and the installation of 441 solar panels across two roofs. The building on the outskirts of the town itself is built using natural materials and rated BREEAM excellent, the highest environmental rating available. Beth said: “This year we’ve made some significant investments to ensure that we’re as sustainable as possible, with many more coming within the next 18 months, including purchasing an electric vehicle to help with local deliveries, installing EV charging points for customers and further cutting our carbon footprint.